JAISAL NOOR: The decision to close a critical pediatric unit in one of Baltimore’s low income neighborhoods was met with controversy on Tuesday. 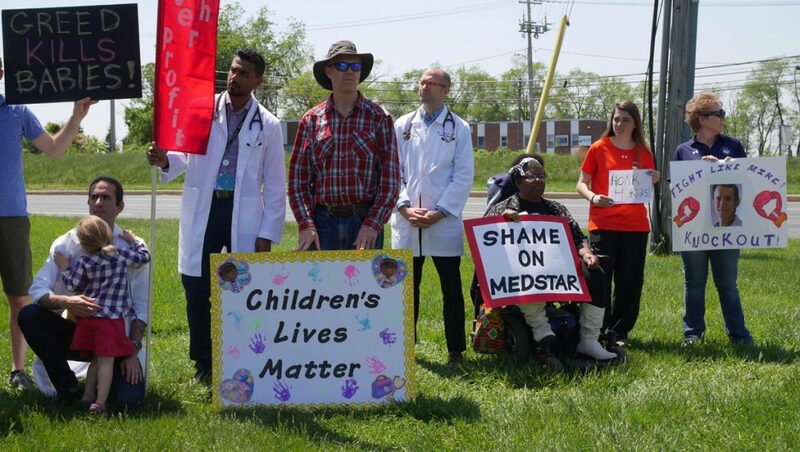 MedStar hospitals decided to shutter its pediatric department and emergency pediatric department in Franklin Square outside of Baltimore, and lay off dozens of staff, which prompted outrage at a rally on the afternoon of May 8. The company did not respond to multiple requests for an interview or comment for this story. Doctors and community members say the closest hospital with pediatric departments is almost a dozen miles away, which could endanger children’s health, says Dr. Max Romano. MAX ROMANO: I take care of patients across the street from the hospital, kids and adults, and I used to take care of kids in that hospital. And I’m terrified that next week there’s a six-week-old that’s going to walk into my office with a fever and having trouble breathing, and I’m gonna have to put them in an ambulance, and they’re going to have to travel 20 or 30 minutes across town to see a pediatrician to take care of them. I’m terrified. And it’s either going to happen next week, or the week after that, or the week after that it’s going to happen. And I’m terrified somebody is going to come in with a seizure, and they’re going to be taken care of by an emergency room doc who hasn’t taken care of pediatric patients since they were in residency a decade ago. And they’re going to give them the wrong dose of medication, and there’s no nurse that’s going to catch it, because they don’t have nurses. They fired all the pediatric nurses. And maybe even scarier is some, some nine-year-old is going to come in with a runny nose. And they’re going to get the perfect care for that runny nose, but nobody’s going to notice the bruise on the back of their leg that is an early sign of child abuse that are child abuse team here would have caught up and would hae intervened on early, before the kid could be put back in danger. I’m terrified of those things happening because we’re just not serving our community. I’m not a hospital administrator. I don’t know anything about balance sheets to know what is running in the red or in the black. But at the very least the community has to be at the table. This was done behind closed doors, and it was announced after the decision had been made. And that’s not how institutions like Franklin Square, that receives hundreds of millions of dollars of public money every single year, should act. JAISAL NOOR: Anna Reed, one of the doctors laid off at Franklin Square, says MedStar must rethink its decision. ANNA REED: Dangerous. They’re already dangerous. We’ve already heard lots of stories of bad outcomes. The reason that we were given that the unit was closing, that this was happening, was that it was a business decision. It was a purely business decision. And to me that means that they’re looking at their bottom line. It doesn’t look good. They looked for something to cut, and they decided that this was it. JAISAL NOOR: A sentiment echoed by families of patients, doctors, and advocates gathered at the event, who said MedStar is putting profits over the health of its patients. SCOTT SHELLENBERGER: Franklin Square for years has been an integral part of our child protection team. The child abuse cases in this county are investigated by the police department, social services, the health department, the State’s Attorney’s Office. But the medical component was here at Franklin Square. Dr. Krugman is a national expert in the area of pediatrics, particularly in the area of physical child abuse. We used him countless times in court. The doctors and the nurses and the staff here do an excellent job and have formed a great partnership with the Baltimore County State’s Attorney’s Office in helping our most vulnerable victims, and that is the victims of physical and sexual child abuse. And to walk away from that is walking away from this community, and more importantly, not contributing to the community’s benefit. 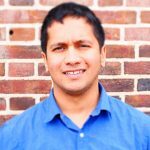 KRISH VIGNARAJAH: And we’ve got to make sure that particularly when it comes to our children, every child, no matter what zip code, county, community they grow up in, that they have access to the basic health care that they deserve. And so I stand shoulder to shoulder with you, because we have to make sure as parents and practitioners that we don’t cut critical staff, particularly in areas that we know are already underserved. I stand by you shoulder to shoulder to make sure that as parents and children we guarantee that our kids can get health care where they grow up, because even moving these services 10 miles away we know can be the difference between whether they get access to these services or not. MARY SCOTT: Our children’s lives matter. This needs to be done. We need to make sure it’s open. As a nurse said to me the day after the unit was closed, when I asked why she was in the unit, she said, Mary, they put me over here because I was PAL-certified, meaning pediatric advanced life support. She said, “I’ve never been oriented. I’m the only nurse here. If a really sick child comes through that door, I don’t know what to do for that child. And I’m not going to have the death of a child on my conscience. We have near misses every day here. We do not have the dedicated, credentialed, trained clinicians and staff, going down from doctors, nurses, techs, even down to the unit secretary, that knew what they needed to do to take care of the patients. Pediatric Room 17 was a well-oiled machine. When a really sick child came through, everybody assembled, everybody knew what they had to do, and they made sure that that child was taken care of. This is a disaster. JAISAL NOOR: Rev. Annie Chambers said the closings will cause severe hardship for those that rely on Franklin Square, as it will take hours to travel by bus to other hospitals with pediatric departments. ANNIE CHAMBERS: This unit was very, very important to low income working people, you know, for our children. And we know that our children could come here. You know, the surrounding communities of this hospital, Franklin Square, must have realized that all of the community, we had children all over. And we are saying shame on them, that they would close the unit, and our children don’t have anywhere to go except a far, long way. JAISAL NOOR: Many speakers voiced support for an alternative single-payer health care system which would ensure medical coverage for all and deincentivize such closures. DONNA HINES: Shouldn’t be big business. I have a few questions to MedStar. Before they closed this unit, did they cut the bonuses of their administrators? Did they do away with any of their jobs? This has to stop. This is a good example of why maybe we might need universal health care. Everyone in this state, everyone in this country, deserves good quality healthcare that is affordable. The research I have done indicates that over 50 percent of these children were Medicaid recipients. Is that why they closed this unit? That makes me mad. SPEAKER: My grandchildren, my great granddaughter, and my other granddaughters have been to Franklin Square. We’ve been here for over 20 years. And it’s a blessing to know when we came in that they were going to be checked out. We brought Junior here three months ago, and he had bronchitis. They diagnosed that within an hour. We were already out, and they were bringing other patients in. To close Franklin Square pediatric ward was a very huge mistake for all our children and our grandchildren. SPEAKER: I was an employee at Franklin Square Hospital for 34 years. And I went into nursing, graduated in ’57. But I have nine grandchildren who live in this area, one of whom has asthma and severe allergies. They live in this area. Time is of the essence, and I know that. I think this was a grave mistake. JAISAL NOOR: We will continue following this story for the Real News. This is Jaisal Noor.